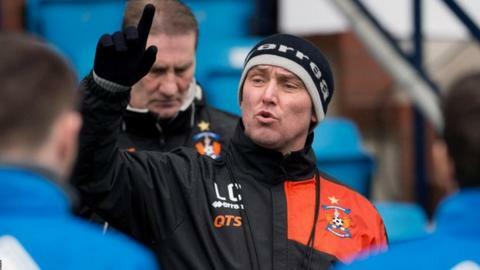 New manager Lee Clark has already earmarked two areas of improvement for Kilmarnock: fitness and retaining possession late in the game. The Englishman spent his first game since his appointment taking a back seat while the Premiership side lost their Scottish Cup replay to Rangers. "Those are a couple of things that stood out, certainly towards the end of the game," Clark told BBC Scotland. "It is just about gradually getting the message across." Clark, the former Huddersfield Town, Birmingham City and Blackpool boss, will take charge properly for the first time when Dundee visit Rugby Park on Saturday in the Scottish Premiership. The 43-year-old took "lots of positives" from Tuesday's game, despite the 2-1 defeat by the Championship leaders. "There were some terrific bits of play, I thought we scored a tremendous goal and, for 60-65 minutes, we were more than a match for a really good Rangers team," he said. "We obviously got a bit tired and fatigued towards the end of the game, so obviously fitness is the one that we can work on. "When you lose a bit of your fitness towards the end of the game, you lose a bit of composure on the ball and you give it back to the opposition a little bit quicker, so that's another area in terms of keeping the ball and making the opposition work for it." Clark has already made alterations to Kilmarnock's training regime since his appointment on Monday. "Obviously the fitness one is going to need to be a gradual thing because we cannot rip into the players and go from nothing to full tilt because then you run the risk of picking up injuries and we can't afford to do that," he said. However, Kilmarnock defender Conrad Balatoni revealed one intriguing change to their preparations. "We're coming in a bit later and we're doing this chronological training where you're training the same time as you're going to be playing, so I'm looking forward to seeing how that goes," he said. "We're looking forward to working with him in the coming weeks and hopefully improving ourselves as a team. "He says he's very approachable, so that's always good. "It's always good when someone with his knowledge of the game comes in and he can tweak a few things."